Boy, oh boy, was I thrilled to see the link on CBR declaring that the Doom Patrol clip and stills were available. I'm not sure what the actual air date is, but it seems like it might be tied to Teen Titans Go! Admittedly, I found the one and only episode of TTG! that I've viewed to be a little too pointless for me. That said, I do supposed this is why Niles Caulder invented DVRs, right? Thanks to my favorite freelance employer, Comic Book Resources, here is the clip in all of its forty-seven second wonderfulness. 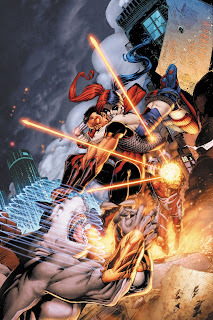 I love the way Rita and Cliff work together, the way Larry's body falls limp, the crotchety old man voice they gave Immortus - I love EVERY BIT of it and cannot wait to see more!! Sure, this is a bit of a stretch for a Gal Friday feature, but I'm making and breaking my own rules here. Let me know what you think of the video, friends. When did you see it? How did it rate compared to the show it was paired with and who would you like to see more of? Back on Track? Maybe. . .
As most of y'all know, I'm a reviewer for CBR. 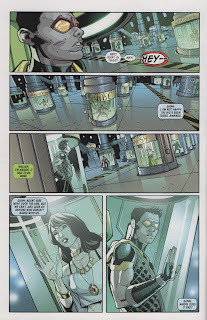 As fate would have it, I was reading Justice League of America's Vibe #5 for a potential review when I noticed something. Something Doomy. 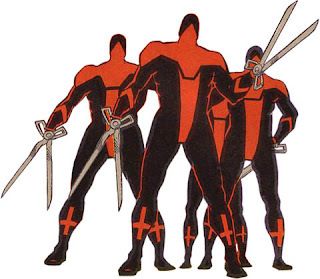 Yes, my friends, Scissorman. Or at least "RMAN" labeled on a tube containing a red and black character with scissor-like hands. Sure, it's singular, but where there's one. . .
Now I've been a fan of the Justice League in Detroit since I bought Justice League of America Annual #2 off the comic rack at the neighborhood convenience store way back in 1984. Vibe and Gypsy are characters I have faith in and enjoy reading, but to see a connection - albeit slight - to the DP in this title, well, Sterling Gates and crew have given me yet another reason to stay plugged in to one of DC's more fun series. 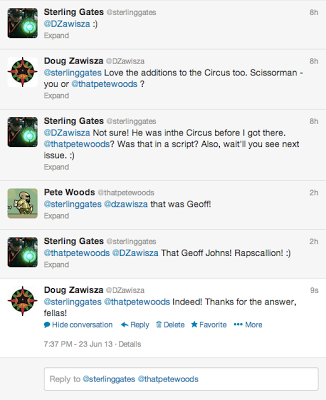 Thanks Geoff Johns for the nudge in the right direction! Isn't it time to get the DP back on the publishing schedule though? Hey all! Sorry for the complete void of, well, anything DP related for the past, well, too long. I've been busy, life's been busy, but today was a VERY rare day away from work and with it came a volunteer shift at Motor City Comic Con. After the volunteer gig, I was able to catch up with Matthew Clark, one of my favorite artists. More on Mr. Clark soon. In related news, I was able to FINALLY secure the two issues of Superman Family that have been eluding me. 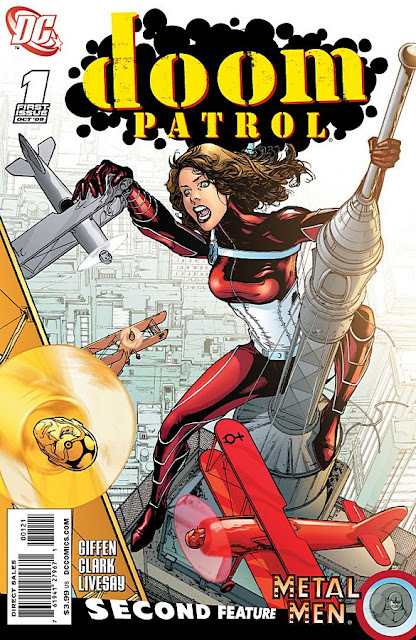 Those two issues contain some Doom Patrol goodness and I'll share them here soon. And yes, I do still owe y'all a CBR-style review of Arcudi and Huat's first issue. But for now, behold the bounty I scored for $17!! Twelve comics and a big-head Firestorm card! Take that, Shag! In case you never check the links to the right of these posts (and, seriously, WHY don't you?) then you might not be aware of Aquaman Shrine or Firestorm Fan. Ah, nuts, who am I kidding? Y'all probably came FROM those sites to visit this one. Aquaman Shrine is managed by the amazing Rob Kelly, who also crafted the banner for this site, while Firestorm Fan is run by Shag Matthews. Both fellas are stand-up guys and have a wonderful banter that comes through nicely in their conversations about comics on their podcast. If you haven't heard of them, though, be sure to check out those sites AND their tandem podcast. The podcast can be found on iTunes, just search for "Fire and Water Podcast." Occasionally on their podcast they do a review of the 1980s Who's Who series. In their latest podcast they cover the seventh issue of the original Who's Who. 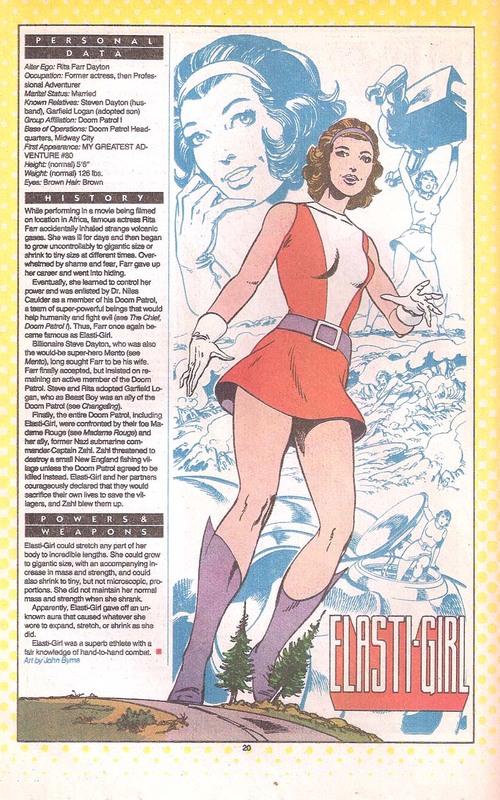 Included in that issue are entries to the original Doom Patrol and Elasti-Girl drawn by John Byrne as well as an entry to the then-contemporary Doom Patrol drawn by Erik Larsen. I gave a brief overview of the entry to Elasti-Girl waaaaaay back in 2009. Here's a link to Shag's summary of the podcast as covered on Firestorm Fan. When Ted Bruder gets negative, he gets negative, man. Another Friday, another image of a Doom Patroller. . .patrolling! From volume 3, here's Fever training a bit with Cliff Steele. The expressions, especially Shyleen's Archie-esque swoon are just priceless. 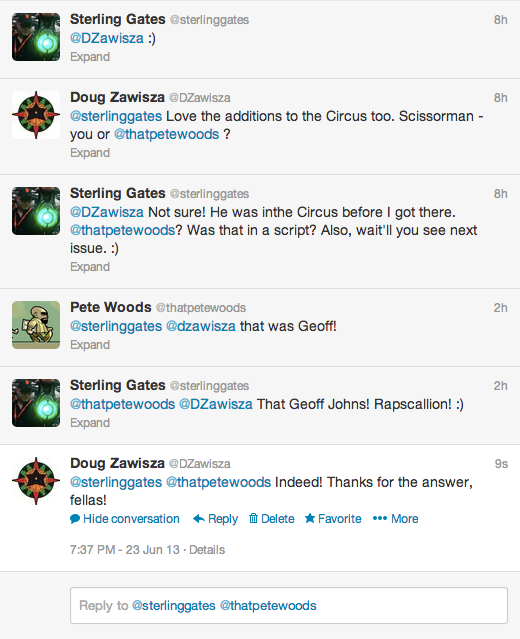 Life, as they say, has happened quite a bit this week. Therefore, I did not get to the review of Doom Patrol #1. It's coming, mind you, but not today. In the interim, feel free to check out one of my reviews over on CBR. 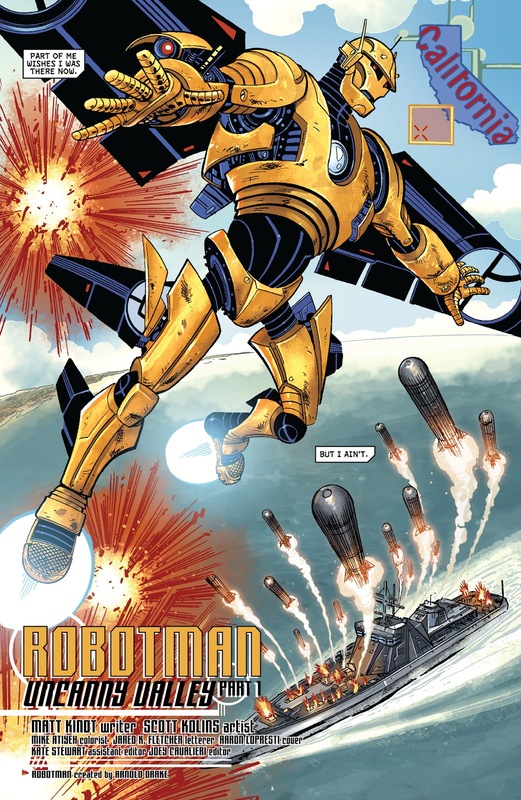 Maybe print it out and scratch out a character's name throughout the review and replace it with "Robotman." Then do the same, replacing the writer with "Arcudi." Then you'll have a do-it-yourself review that reads like a Mad Lib. Good times. Quick post for today. Looking into the future a bit, past the snow and ice, mid-May always brings the Motor City Comic Con to Novi, Michigan. Novi, for those of you non-Michiganders, is roughly a half hour outside of Detroit. The con itself has trended towards pop culture more than comics in recent years, but this year sees a MAJOR upswing back into the world of comic books. Why's that you ask? Well, some guy named Stan Lee's going to be there. And another fella named George Pérez. Rafael Albuquerque and Mike McKone are also on the guest list, but the one comic creator I'm most eager to meet is Doom Patrol volume 5 artist Matthew Clark! I cannot even begin to tell you how thrilled I am to finally have a chance to meet Matthew. He's been über-generous with his time for this blog and his reinterpretations of the DP are definitive in my mind. I'm happy to have a chance to finally shake his hand and thank him. In May. Just a few more months to go. Hopefully by then we'll see more DP in the DC Universe, but I'm not going to hold my breath. No sir. Instead I'm going to keep reading my Doom Patrol back issues and breathe easy knowing that I don't have to go too far from home to find a great array of comic book creators this coming con season. For those of you thinking about coming to Novi that weekend, the Detroit Tigers aren't at home, so you'll have plenty of time to focus on the comic con without feeling like you're missing something. Here's a link to the comic guest list for the con. As mentioned earlier and as is my prerogative for My Greatest Adventure 80, I've rebooted the Girl Fridays to Gal Fridays and extended their reach beyond solely focusing on appearances of Rita Farr. Sure, Rita will make appearances here, but not right now. Today's Gal Friday is a double-feature: Fever and Freak. 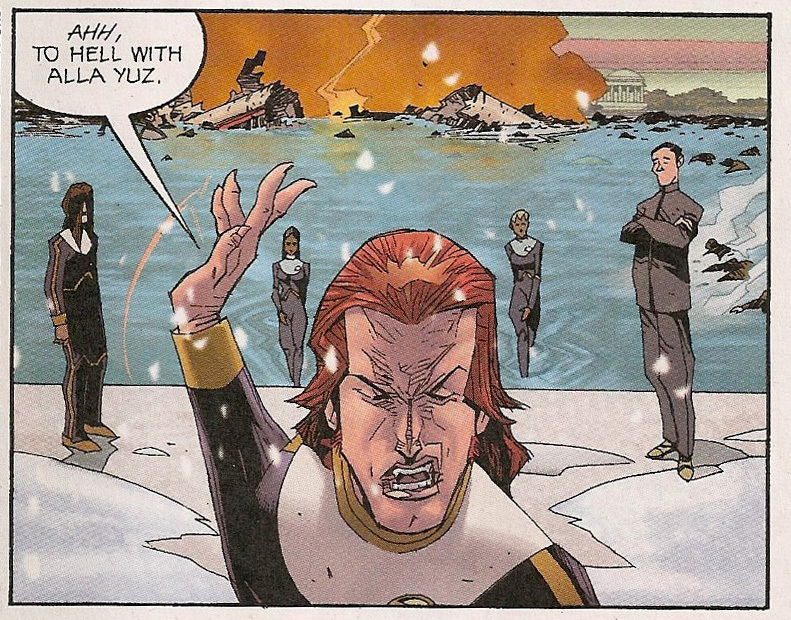 In this panel, the final page of Doom Patrol #1 (volume 3) by John Arcudi with art by Tan Eng Huat, colors from Dave Stweart and letters from Bob Lappan, the team strikes a pose and forgets to stand in front of anything remotely resembling a background. 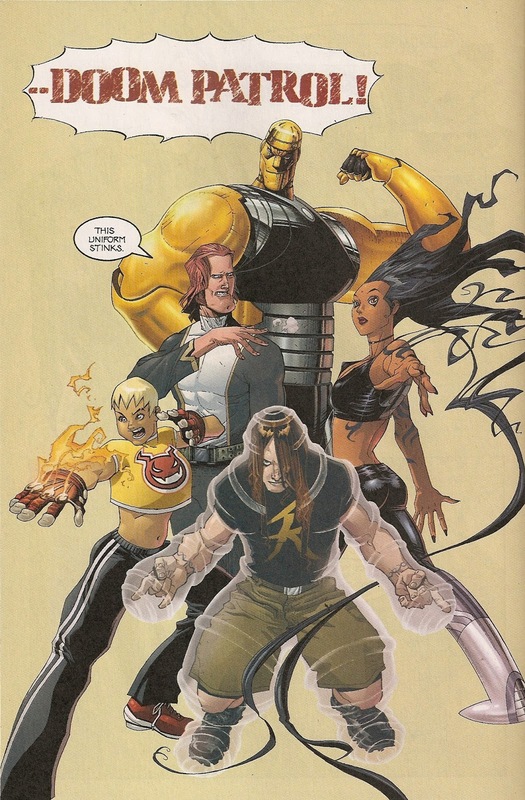 Kid Slick and Fast Forward round out the team under Robotman's supervision. I haven't done this in the past, but I've threatened to do so. In 2013, I plan to review, as I do for Comic Book Resources, a run of Doom Patrol. I've been wanting to unlax my poor little brain from so much of today's comics by reading (or re-reading) some DP adventures, but just haven't been able to fit it in. So I hemmed and I hawed. I really wanted to take a swing at John Byrne's 2004-2005 volume (Volume 4 as it were), but the fine fellows at Doom Podtrol are doing a very good job with that series. Alternatively, they're tackling the Morrison issues of the second volume of Doom Patrol with episodes in between their Byrne musings. Scott and Murray have also hit the highlights for the last, pre-New 52 volume as well as the original series, so that really only leaves the John Arcudi and Tan Eng Huat collection. That said, beginning Thursday, January 10, I'll be reviewing the entire run, one issue at a time. During the week I'll post panels from that book resurrecting Negative Mondays and Gal Fridays (formerly known as Elasti-Girl Fridays) and using DC's philosophy of selectively re-numbering continuity. Fridays following the post will include a panel featuring one of the DP's female characters, but Monday before will feature someone being in the issue coming up. So there you go: Negative Mondays and Gal Fridays return in 2013. See y'all on Monday! I promise not to be brutal with the reviews, Cliff! I'm not sure how long DC can call the rebooted DC Universe line "The New 52," but for sake of clarification, I'll play along. For now. 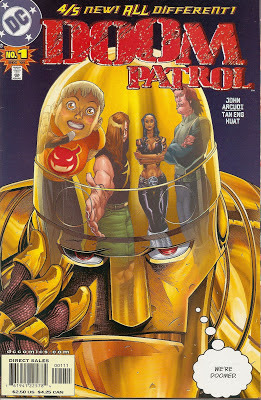 I'll fully admit, I have no clue whatsoever if the Doom Patrol ever existed in this post-Flashpoint world. I seriously doubt it, since there really is no concrete evidence of Larry Trainor or Rita Farr, at least not that I've seen. I mean maybe Larry flew with Hal Jordan still if that one issue of Green Lantern is still in canon, but DC has some powerfully selective memories for what still holds true and what doesn't. 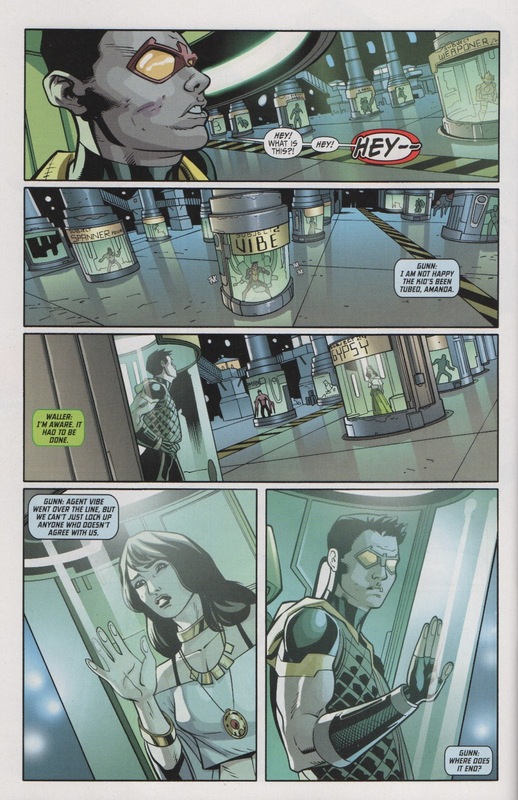 Danny the Street has appeared in Teen Titans. I haven't been getting that book, but there is a nice little story here on Comics Worth Reading. I'm certain this cannot possibly be as creative as the original Danny concept or even Giffen's re-imagining of the character as Danny the Brick. Niles Caulder is a recurring character in Ravagers, a title which also stars one-time Doom Patroller Beast Boy. Admittedly, I haven't given this title much attention or money as every issue I've sampled of it woefully disappoints. Furthermore, neither character seems to have much resemblance to their previous incarnations. 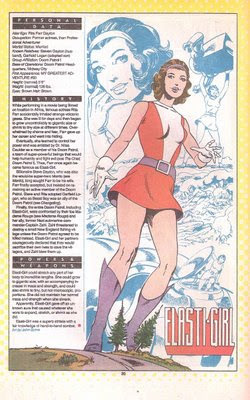 Caulder is still a scientist, but ambulatory and affiliated with other characters, like Fairchild and Superboy. Beast Boy is red now, a visual cue that he is connected to the same mystical source of animal-based power used by Animal Man. Unfortunately, I personally find Ravagers to be an awful comic book from concept to execution, and cannot justify shelling out three bucks a month for something that may or may not (smart money is on "not") pan out to be Doom Patrol-related. 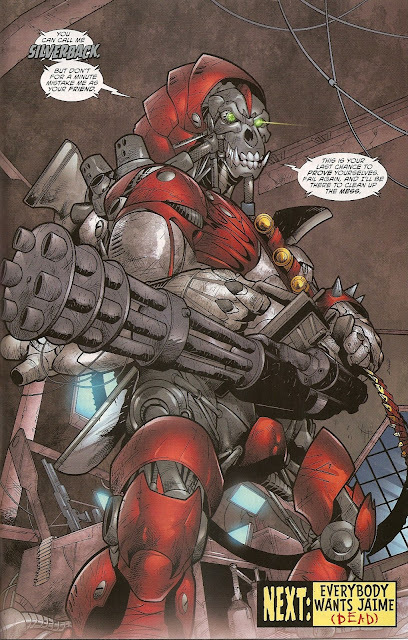 It is, however, the strongest chance we have to see more Doom Patrollers, so if anyone else is more tolerant of the title than I am, please share your discoveries. Cliff Steele appears in My Greatest Adventure along with Maddy Rouge. I'll get more in depth on the adventures of Cliff Steele in that comic book very soon. Finally, re-imagined members of the Brotherhood have popped up in the pages of Blue Beetle. That Brotherhood included an unnamed employer, Phobia, Warp, Plasmus and a character that seems to be part Mallah, part Brain in the form of Silverback. Sadly, I don't think we'll ever get a Silverback action figure, but take a gander down below and let your imagination wander. Those are the post-reboot appearances I have figured out (with confirmation and collaboration from folks far and wide across the interwebs, but notably the gentlemen on Doom Podtrol and my fellow CBR reviewer, Greg McElhatton). Sorry I've been so intermittent throughout 2012, my friends. Life gets busy when you're raising three kids with various activities throughout the year, changing jobs and reviewing at least six comic books every week on the side. Excuses? Nah. Just facts. I'm not a master at time management, but by golly, I'm learning how to squeeze in as much as possible into the time I have available.